Following ties against fellow Northern League sides in the qualifying rounds, Whitley Bay will be taking on unfamiliar opponents in the first round proper of this season’s FA Vase. 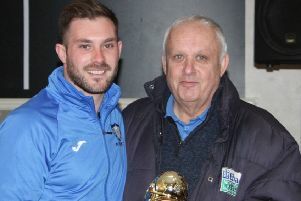 The four-time winners will be travelling to Manchester to play Northwich Manchester Villa on Saturday, and it was only in the last week that the venue for the game was finally decided. The hosts were told that for ground grading reasons they were unable to play the game at their Manchester Regional Arena home ground, which is alongside Manchester City’s Etihad Stadium, so the tie has been moved 11 miles across the city to Silver Street, the home of Irlam FC. The Manchester side play in the North West Counties League first division, which is at the same level as the Northern League second division. They are currently in 13th but with only one defeat in their last five games. The two sides have never previously met but it will not be Whitley’s first visit to Silver Street as they played Irlam seven times between 1988 and 1991 when both were in the Northern Premier League division one. In four visits to Irlam, Whitley won three times, losing just once, in a league cup tie. Whitley will be well supported and seats on the Supporters’ Club coach were quickly snapped up. One good piece of team news is that Callum Anderson returns to the squad after completing his suspension, but Chris Reid, Phil Lumsden and Steve Gibson could all miss out through injury. If the game is level after extra time, the replay will be at Hillheads on Tuesday evening, but otherwise they will travel to Jarrow Roofing for a Northern League game that evening when Bay legend Paul Chow will be in the opposition ranks. On Thursday, November 5, Whitley Bay FC will once again be holding a fireworks display at Hillheads, at 7.30pm. Gates open at 6pm and admission is £4. Last year’s event proved extremely popular and to speed entry to the ground, tickets are on sale from the Seahorse Clubhouse any evening. Admission will also be available on the gate.